In 2011, the Ipê network went through a great qualitative leap, reaching the added capacity of 213.2 Gb/s, a 244% increase in relation to the previous added capacity. This expansion was the result of a cooperation agreement with telecommunications company Oi, in 2010, which provides RNP with an optic fiber transmission infrastructure using wavelengths. Thus, the sixth generation of such communication infrastructure for education and research was designed to ensure not only the bandwidth needed for the usual Internet traffic, but also the use of advanced services and applications and experimentation. Now, the great challenge of the institution is to take advanced Internet infrastructure to the states´s countryside, qualifying students, teachers, researchers and institutions´s collaborators in education, health and culture segments to allow them to communicate and collaborate with their peers throughout Brazil and the world. In January 2002 the RNP Association (AsRNP) was qualified by the federal government as a Social Organization. With that, it obtained greater administrative autonomy to perform its tasks and the public power, more effective means of control to value and supervise the achievement of the goals set for the organization. 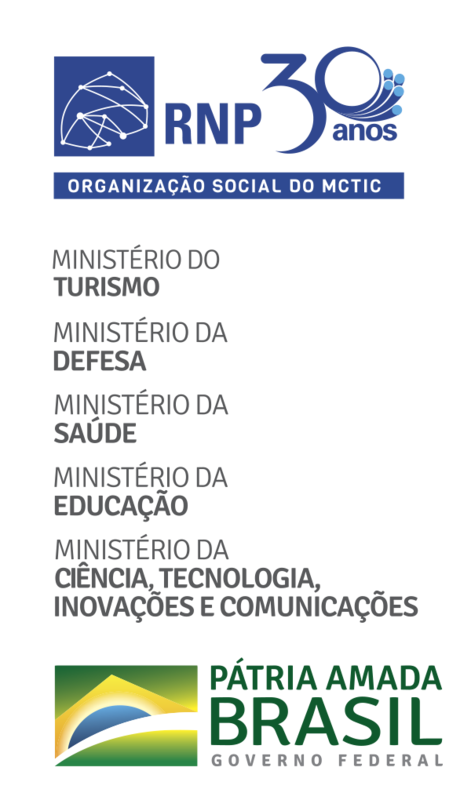 On March 26th 2002, the Brazilian National Research and Educational Network Social Organization (RNP/OS) entered into a management agreement with the MCTI. In this, RNP/OS undertook to reach certain goals, aiming at the fostering of the technological research activities in development networks and the operation of means and services of advanced networks that benefit national research and teaching. In 2005, RNP began the construction of its own metropolitan networks, to provide access between each Point of Presence (PoP) and the campuses of the organizations that are users in the same city through the Community Education and Research Networks (Redecomep). These metropolitan networks allow the provision of high-capacity connections, usually at 1 or 10 Gb/s, between the PoP and the campus, using an optic fiber infrastructure built by RNP. In 2014, the networks are already being used in nearly 40 cities in the country. In that same year, the backbone technology, which was renamed Ipê network, was updated with optic links (wavelengths) operating at multiple gigabits per second. The initiative of improving the network infrastructure at a national, metropolitan and local (campuses’ networks) levels was called New RNP, which aimed to meet, with innovative applications and services, the demands of specific communities (telemedicine, biodiversity, astronomy, etc. ); and promote the qualification of human resources in information and communication technologies. In May 1995 the commercial Internet was launched in Brazil. In that period, RNP went through a redefinition of its role, extending its access services to all sectors of the society. With that focus reorientation, it offered important support to the consolidation of commercial Internet in the country. The Internet Information Center/BR was created to support the appearance of network providers and users. Over 3,000 Internet-related questions were replied to in its first year of operation. It also created the first Brazilian network security center. Several companies that manufacture IT products, such as Compaq, Equitel, IBM, Philips, among others, started to provide concrete support to the RNP, supplying equipment, software and even funding direct activities of the project. In October 1999 ten years after the creation of the RNP project, the ministries of Science, Technology and Innovation (MCTI) and Education (MEC) signed an agreement, the Inter-ministerial Program of Implementation and Maintenance of the National Education and Research Network (PI-MEC/MCT), currently called Inter-ministerial Program RNP (PI-RNP), with the purpose of taking the academic network to a new level. Both ministries invested in the implementation of the RNP2 backbone, the first advanced network infrastructure, able to meet the new band and service needs for teaching and research. The National Education and Research Network Association (AsRNP), created in that same year by the collaborators of the RNP project, was intended to develop and run the program, under the guidance of a Management Committee (CG-RNP) formed by representatives from MEC and MCTI.The RNP2 backbone was officially opened in May 2000. RNP was created in September 1989 by the then Ministry of Science and Technology (MCT). Its purpose was to build a nation-wide Internet network infrastructure for the academic segment. The National Research Network, as it was called first, was also intended to disseminate the use of networks in the country. In parallel with the implementation of its first network, in 1992, which achieved 10 states and the Federal District, RNP was dedicated to sundry tasks, such as advertising the Internet services to the academic community through seminars, assembly of themed repositories and training programs, stimulating the formation of awareness of its strategic importance to the country and becoming a reference in Internet technologies applications. If you want to know more about our history, click here to see RNP's pages on the Internet since 1997. Simply choose a year and a valid date as 12/10/1997, for example, to access a website image at the time.